Skyline Group provides proprietary, cutting-edge Human Resource coaching solutions primarily for Silicon Valley tech companies – they came to Rasteroids looking to develop a '360 learning platform' based on the statistical methodologies work of their founder, Dr. Gustavo Rabin. Rasteroids designed and developed an entire 360 system from the ground up – from logo design and identity to front-end to the back-end database development. 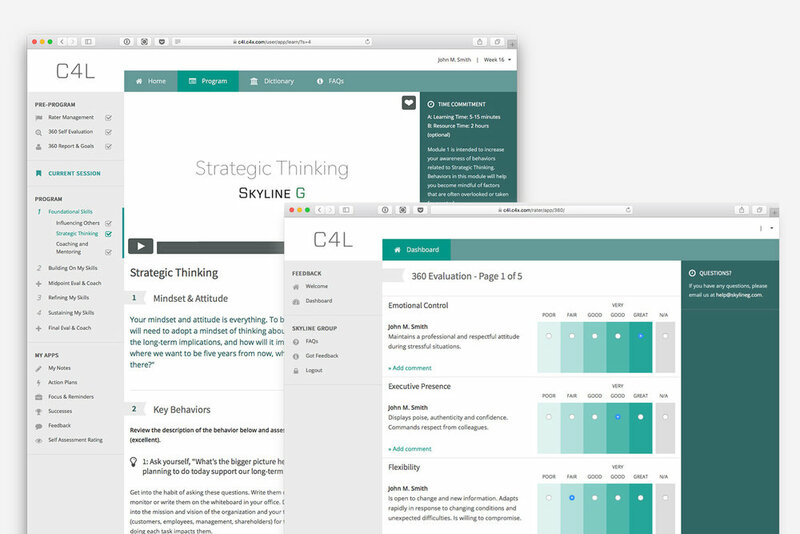 The system includes separate roles for managing learning content, companies, coaching, users and raters – each with a multitude of unique tools and data analytics created specifically for Skyline. Rasteroids and Skyline designed an easy stepped process that is coach-managed. On the back-end, we built a one-click reporting tool that generates a beautifully designed 35-page report about the participant; evaluating the participant using normative statistics against 5,000 prior participants of the exact same survey conducted by Dr. Rabin over 30 years. Rasteroids also developed a 16-week learning platform completely custom to the participant needs with Skyline-managed resources, checklist items, tutelage and ongoing colleague rating.